Chucklehuck Woods is a forest in the Beanbean Kingdom, southwest of Beanbean Castle, that is the only location for the Chuckola Fruit (the main ingredient of Chuckola Cola) and Winkles. 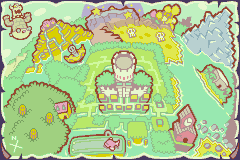 It appears in Mario & Luigi: Superstar Saga and its remake as the fourth world in the game; Mario and Luigi travel here to find the Chuckola Reserve, so they can heal Queen Bean from the Belly Blech worm Cackletta forced her to eat. They also come for a second time to retrieve the Beanstar Piece that fell in the area. Chateau de Chucklehuck sits on the forest's edge. The forest itself is dark and forbidding, full of Pestnuts, Chuck Guys, and Fuzzbushes. 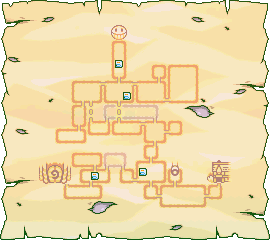 It also includes two talking stumps, Chuckleroot and his granddaughter (and presumably his daughters or sons as well); another tree, Mother Chuckalola also appears, but it is unknown if this (seemingly important) plant is capable of speech or thought. Mario must find three types of Chuckola Fruit in the forest so that Chuckleroot will let him pass: red, white, and purple Chuckola Fruit. The major boss at the end of this world is Chuckolator, and a Wiggler is also fought here. At the end of the second visit to the woods, Popple also battles the Mario Bros. In the northern part of Chucklehuck Woods, Warp Pipe #5 can be found. The Chucklehuck Woods are also home to the Winkles, and the Winkle Colosseum is located in the deeper parts of the forest. 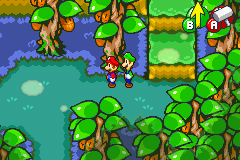 In Mario & Luigi: Superstar Saga + Bowser's Minions, the forest is much darker, while the music is more tribal and ominous-sounding. In addition to the items listed below, Hee Beans can be obtained by playing Chuckola Bounce. Mushroom In the second screen from Chateau de Chucklehuck, in the ? Block above the big platform. 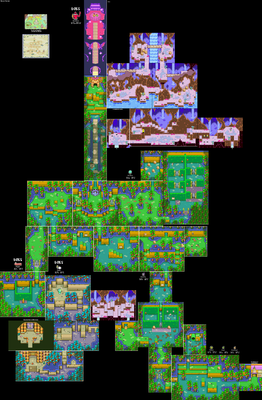 In the second screen from Chateau de Chucklehuck, there's a warp pipe to the north. The item is in the rightmost ? Block near the pipe. In the fourth screen from Chateau de Chucklehuck, in the south ? Block in the east hedge. In the cave screen on the path to the Winkle area, in the ? Block in the north. Two screens before the Chuckleroot there's an area to the right. The item is in the northeast ? Block there. In the area to the left of Chuckleroot, there's a cave to the southeast. The item is in the center ? Block in the first scene. In the area to the left of Chuckleroot, there's a cave to the southeast. The item is in the ? Block in the southeast of the second scene. In the area to the left of Chuckleroot, there's a cave to the southeast. The item is in the left ? Block in the third screen. On the path to Mother Chuckalola, in the northwest ? Block in the south. In the second scene beneath Mother Chuckalola, in the ? Block in the south. In the second scene beneath Mother Chuckalola, in the ? Block in the west. In the third scene beneath Mother Chuckalola, in the ? Block in the southwest. 1-Up Mushroom In the Nokottasu screen on the path to the Winkle area, in the northwesternmost ? Block in the west. On the path to Mother Chuckalola, in the ? Block in the north before the stairs. Nut In the north screen of the Winkle area, in the ? Block in the southwest. Syrup Jar In the second screen from Chateau de Chucklehuck, there's a warp pipe to the north. The item is in the leftmost ? Block near the pipe. In the fourth screen from Chateau de Chucklehuck, in the west ? Block in the east hedge. In the fourth screen from Chateau de Chucklehuck, in the east ? Block in the east hedge. In the area to the left of Chuckleroot, take the southeast path, and in the ? Block above the platform to the left of the door to the cave. In the area to the left of Chuckleroot, there's a cave to the southeast. The item is in the right ? Block in the first scene. Refreshing Herb In the Big Koopa Troopa screen on the path to the Winkle area, in the southeasternmost ? Block in the west. Two screens before the Chuckleroot there's an area to the right. The item is in the southeast ? Block there. In the screen to the left of Chuckleroot, in the ? Block above the northeast platform. On the path to Mother Chuckalola, where the path is split, in the ? Block on the west road. Beanstar Piece In the north of the Winkle area. Requires fighting Popple. Purple Chuckola Fruit In the area to the left of Chuckleroot, there's a cave to the southeast. The fruit is at the end of the cave. Red Chuckola Fruit In the area to the left of Chuckleroot, inside a hedge to the southwest. White Chuckola Fruit In the area to the right of Chuckleroot, deep in the hedge in the second screen. Winkle Card In the Winkle area, won after beating the Winkle minigame. For a list of hidden blocks found in Chucklehuck Woods, see here. For a list of beanholes found in Chucklehuck Woods, see here. Geragōnyu no Mori Geragonyu Woods. Geragōnyu (ゲラゴーニュ) comes from gera gera (ゲラゲラ), a loud laughter bordering (or past bordering) rudeness. Spanish Bosque Jijí Heehee forest. Dutch Grinnhikwoud Pun on grinnik, meaning chuckle, and hik, meaning hiccup. Woud means forest. This page was last edited on April 10, 2019, at 23:14.